To navigate Portland, it’s essential to grasp the “Five Quadrants” orientation. To determine where something is located, you need to know if it’s in Northeast, Northwest, Southeast, Southwest or North. Many streets span more than one quadrant. For instance 2000 NW Glisan is a very different part of town than 2000 NE Glisan. If you’ve got the wrong quadrant written down, you’ll find yourself endlessly lost on the opposite side of town. Get it right, though, and you can quickly find where you’re going. But if there are five of these regions, why are they called quadrants? Some people like to say Portland has five quadrants because Portland defies math. Or that it is in keeping with the spirit of “Keep Portland Weird”. It turns out there is an origin story, albeit a rather vague one. Early Portland evolved to designate Burnside Avenue as the dividing line between North and South Portland, and the Willamette River as the dividing line between East and West Portland. In the early 1900s, traversing the city was no easy task. Dirt and plank roads were often bumpy, and muddy for rickety horse-drawn wagons and for people walking. Around 1920, cars began to drastically alter the urban landscape. 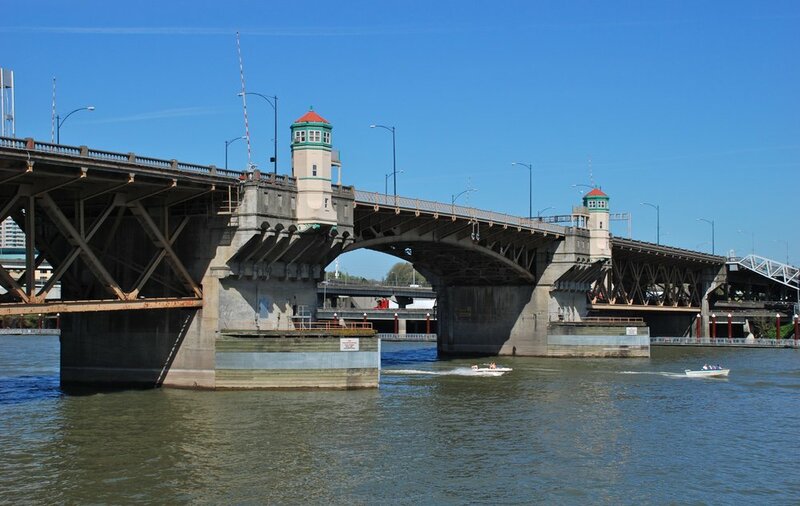 At this time, many streets were widened and the Burnside Bridge was replaced with a larger crossing, officially designating it as a major thoroughfare that spanned far across the city. The river and Burnside Street delineations still exist to this day, a helpful bit of Portland Navigation 101 if you are new to the region and still settling in. At the time of early city planning, what is now known as North Portland was it own city. St. Johns was its own city, too, for 12 years. As Portland quickly grew, these sections were absorbed into the larger city. But in terms of how the different regions were designed, this new area didn’t quite fit into the layout because of the way the Willamette River takes a sharp turn before meeting up with the Columbia River to the north. This area was physically separate. It didn’t quite fit into Northwest because it was on the other side of the river. It didn’t quite fit in with Northeast because it was so far up there. A new area would have to be created, hence the decision to call this region North Portland. North struck around, and so did the term quadrant. Interestingly, as the city grows, in many ways St. Johns now has a very distinct feel as if it were its own city again - a testament to Portlanders’ love for having businesses, shops and cafes just down the street from their homes. To make all of this even more exciting, in 2018 Portland City Council voted to add a sixth section to Portland: South Portland. The transition to adding this region is expected to begin in 2020. Whether or not the city will officially retain the term quadrant remains to be seen. When searching for a home in Portland, there are lovely options in all five quadrants. We can help you explore the different regions, and find your dream home. As far as the quadrants go, we’ll file this one under Keep Portland Weird!